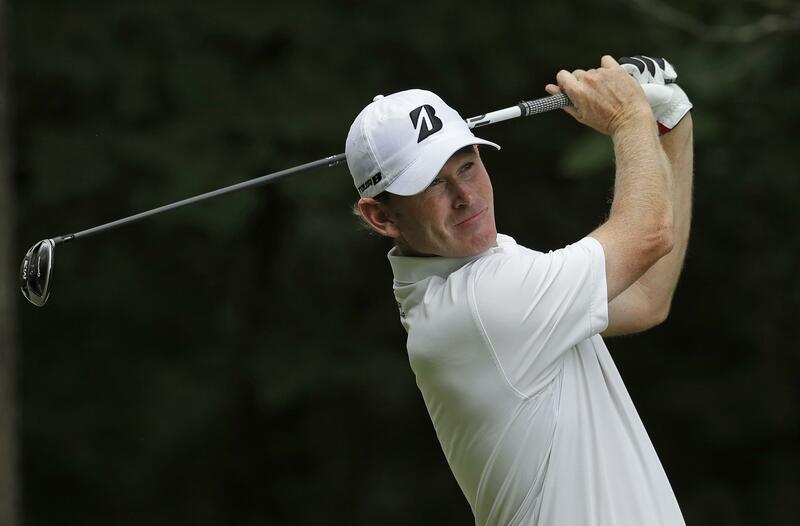 UPDATED: Sat., Aug. 18, 2018, 4:23 p.m.
At Sedgwfield Country Club, Greensboro, N.C.
GREENSBORO, N.C. – Brandt Snedeker is bracing for a long last day at the Wyndham Championship. Snedeker held a three-stroke lead Saturday when the third round was suspended because of severe weather. He was 16 under for the tournament with 11 holes left in the round at the final event of the PGA Tour’s regular season – and is preparing for the grind of playing 29 holes. Snedeker says he’s had a few 36-hole days on tour and hopes his adrenalin takes over when he plays the back nine for the final time. Brian Gay was 13 under through 12 holes, and Trey Mullinax, Keith Mitchell, C.T. Pan and D.A. Points were another stroke back at varying stages of their rounds. Thirty players were still on the course when play was halted during the mid-afternoon with thunder booming and a threat of lightning. After a 3-hour, 23-minute delay, organizers chose to hold things up overnight and resume the round at 8 a.m. Sunday. They said they expect the final round to begin in the late morning, grouping the players in threesomes starting from both the first and 10th tees. When the tournament restarts, Snedeker – who opened with a 59 to become the first tour player this year and just the 10th ever to break 60 – will look to keep himself in position to contend for his ninth victory on tour and his first since the 2016 Farmers Insurance Open. Snedeker, the 2012 FedEx Cup champion, won the tournament in 2007, the year before it moved across town to par-70 Sedgefield Country Club. Snedeker’s final 11 holes of the round could wind up being telling: In seven of the 10 previous years since the tournament’s move to this course, the third-round leader or co-leader has gone on to win. And every leader who finished the third round here at 16 under or better has wound up winning, including Stenson (16 under) last year and Si Woo Kim (18 under) in 2016. “I’ll kind of do what I have to do to finish the third round, reassess what’s going on, where I am in relation to everybody else and what may be happening, and then kind of go to my fourth round with a new strategy,” Snedeker said. Snedeker started the day off strong, rolling in a 60-foot chip for birdie on the par-4 second hole, then pushed his lead to three strokes with a birdie on No. 5 that moved him to 16 under. But after he sank a short par putt on the seventh, thunder boomed and the horn sounded to stop play. Gay was 12 holes into a second consecutive strong round when the delay struck. After shooting a 63 in the second round, he had four birdies and an eagle on the par-5 fifth hole. He placed his 200-yard second shot 10 feet from the flagstick and sank the putt. His Sunday will start in the intermediate rough on the 13th, some 130 yards from the flagstick. “It will be a short night and back out early,” Gay said. Published: Aug. 18, 2018, 3:58 p.m. Updated: Aug. 18, 2018, 4:23 p.m.